Promoting ‘Spiritual Capital:’ What’s In It For Harper? Right-wing guru urges melding religion and money making. Trinity Western University and the Fraser Institute would seem to have little in common aside from their location in British Columbia’s Lower Mainland. Trinity Western is an arm of the evangelical Christian church, with a goal to develop “godly Christian leaders.” The Fraser Institute is a business-sponsored advocacy organization whose goal is to promote deregulation, low taxes and minimal government. They represent the two branches of the right in Canada — social and economic conservatism. They are often at odds. Economic conservatives want government to wither away; social conservatives want strong government to enforce God’s laws, such as prohibiting abortion and gay marriage. But on succeeding days in March 2009, they hosted the same speaker, Dr. Theodore Roosevelt Malloch, who claims that business and religion share many features. The idea that unites them is “spiritual capital.” It is gaining ground in a well-financed effort to paint a friendlier face on capitalism and win elections for conservatives. It’s a concept with a long history, going back to classical works like Max Weber’s The Protestant Ethic and the Spirit of Capitalism. It goes back even further, to the Calvinist emphasis on the need for hard work, since success in the secular world is a sign of personal salvation. Spiritual capital could be a useful concept in humanizing the marketplace. But the money and interests behind it indicates it is being used to co-opt spirituality for corporate and political purposes. Metanexus and Malloch together received $2 million from the Templeton Foundation to set up an organization called the Spiritual Enterprise Institute and disseminate the view that spiritual values underpin successful capitalist ventures. John Templeton, who died in 2008, was a high priest of capitalism who built a billion-dollar fortune selling global mutual funds and moving to the Bahamas to avoid paying taxes. Templeton began his company’s annual meetings with prayers, he said, to clear the minds of shareholders. It worked. His foundation has assets of $1.5 billion and gives away $70 million a year, largely to projects that promote the convergence of science and religion. Malloch, with a PhD in international political economy from the University of Toronto, moves easily among the private, public and non-profit sectors. He’s worked for Wharton-Chase Econometrics, Salomon Brothers, the U.S. Senate Foreign Relations Committee, the World Economic Forum, and the United Nations. He’s connected to the neo-conservative Hudson Institute, which advocates the abolition of government-backed social security, an end to corporate income taxes and a pre-emptive military strike against Iran. Malloch has worked on many Republican presidential campaigns. In the 2008 election, he supported the most conservative Republican candidate, Fred Thompson, the former senator from Tennessee and Law and Order actor. In a paper he wrote for the Hudson Institute, Malloch claims that a “belief in the afterlife, in heaven and hell particularly, is good for economic growth.” Fear of hell, he argues, has a bigger impact on economic performance than “too much church attendance,” which takes “time away from productive activity.” Belief in hell makes you honest, thrifty and work harder, and that’s good for business. His Trinity Western presentation, sponsored by the university’s entrepreneurial leadership centre, was based on an article he wrote in the conservative American Spectator. Malloch addresses what he claims are the deeper roots of the current financial crisis. Greed got us into this mess, he admits. But we are not greedy because of the moral failings of the Wall Street wheeler-dealers who threw all caution to the wind in their stampede to cash in at the expense of the rest of society. We are greedy because of the “corrosive and morally corrupting influence of government,” which stimulates the “something for nothing” mentality. Instead of looking to government handouts and Obamanomics for a way out of the crisis, he argues, we need to return to the moral precepts of Plato, Aristotle and St. Thomas Aquinas. They all believed the basis for human conduct is virtue, not government handouts. His argument falters, however, when he claims that the reason for Wal-Mart’s success is because it operates according to a spiritually-based ethic. One might ask, though, how paying employees rock-bottom wages, exploiting off-shore sweatshops and driving long-established locally based businesses into bankruptcy illustrate a moral code. As an undergraduate at the University of Calgary, Harper came under the influence of Friedrich Hayek, the patron saint of the Fraser Institute and conservative economists. According to his biographer William Johnson, Harper became a disciple. In his most famous book, The Road to Serfdom, Hayek argued that any government intervention such as social welfare or public education, no matter how well intentioned, will inevitably lead to slavery and serfdom. To win elections, Harper needs both social and economic conservatives in his tent. In 2003, Harper discussed his strategy to achieve this at a Civitas Society annual meeting. This secretive organization, which blocks public access to all but minimal information on its website and leaves little paper or electronic trail, is a network of Canadian social and economic conservative academics, politicians, journalists and think-tank propagandists. The Civitas founding directors include many leading lights in Canadian conservatism: Harper adviser Tom Flanagan, REAL Women’s Gwen Landolt, David Frum and Ezra Levant, the Fraser Institute’s Michael Walker and John Robson from the CD Howe Institute, Conservative MP Jason Kenney, Alberta Report’s Ted Byfield and the National Citizen Coalition’s David Somerville. Civitas is top-heavy with journalists who promote conservative causes. Lorne Gunter of the National Post and Ottawa Citizen editorial writer John Robson are past-presidents. Members include Janet Jackson (Calgary Sun) and Danielle Smith (formerly Calgary Herald). Journalists Colby Cosh and William Watson (National Post) and Andrew Coyne (Maclean’s) have made presentations to Civitas. The National Post’s Barbara Kay edits the society’s newsletter. Harper’s 2003 Civitas speech was the source of the charge made by the Liberals during the 2004 election that he had a scary, secret agenda. 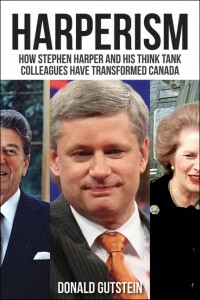 Harper claimed that all major parties had largely accepted an economic conservative frame. Now the task was to return to social conservatism and social values, to change gears from neo-con to theo-con, in The Report’s Ted Byfield’s apt but worrisome phrase, echoing visions of a future not unlike that painted in Margaret Atwood’s dystopian work, A Handmaid’s Tale. The state should take a more activist role in policing social norms and values. To achieve this goal, he said, social and economic conservatives must reunite as they have in the U.S., where evangelical Christians and business ruled in an alliance under George W. Bush. Red Tories must be jettisoned from the party, he said, and alliances forged with ethnic and immigrant communities who currently vote Liberal but espouse traditional family values. This was the successful strategy counselled by the neo-cons under Ronald Reagan to pull conservative Democrats into the Republican tent. It’s also Harper’s strategy, as evidenced by his appointment of Civitas co-founder Jason Kenney as his minister of citizenship and immigration and social conservative Gary Goodyear as his minister of science after the 2008 election. Perhaps. But an issue like euthanasia, which was debated at the conference, shows the deep fissures between the camps, one family or not. Economic conservatives believe they own their bodies and can dispose of them as they see fit. Social conservatives believe that killing someone else, even with that person’s consent, is a sin against God. There’s little room for compromise, but bringing the factions together is Harper’s party-building and election-winning agenda. By co-sponsoring conservative scholars like Theodore Roosevelt Malloch, Trinity Western University and the Fraser Institute keep the fragile coalition alive, while Harper painstakingly constructs his parliamentary majority.